Psy, whose world renowned "Gangnam Style" video has become the first in the history of the internet to reach and surpass one billion YouTube views, will help Rotary achieve its goal of a polio-free world by raising his thumb and forefinger in the “this close” gesture in the ad with the tagline "we're this close to ending polio." “I grew up in a Rotary family as my father and my late grandfather were Rotary members. My grandfather was very passionate and dedicated to Rotary,” Psy said. “He had a big heart and always inspired me to help others.” Psy’s late grandfather had made substantial donations to The Rotary Foundation, the charity arm of Rotary International. The debut of Psy’s polio eradication spot is timely as he will be featured in one of the anticipated commercials in this year’s February 3rd professional football championship game. The Rotary awareness campaign also features public figures and celebrities including Bill Gates, co-chair of the Bill & Melinda Gates Foundation, Nobel Peace Prize laureate Archbishop Emeritus Desmond Tutu, action movie star Jackie Chan, golf legend Jack Nicklaus, conservationist Jane Goodall, premier violinist Itzhak Perlman, Grammy Award winners A.R. Rahman, Angelique Kidjo and Ziggy Marley, golfing great Jack Nicklaus, and peace advocate Queen Noor of Jordan. In addition to the spot, Psy has also joined Rotary’s innovative campaign to develop the World's Biggest Commercial to raise public awareness about polio eradication. Participants simply upload photos of themselves making the “this close” gesture with their fingers – as in, “We are this close to ending polio” – to the ever-expanding promotional spot at Rotary’s End Polio Now website. Along with helping Rotary set a new Guinness World Record, every person who joins the commercial can choose to add their name to a petition urging the world’s governments to provide the US $5.5 billion needed to finish the job and end polio forever. Polio eradication has been Rotary’s top priority for more than two decades. The international humanitarian service organization is a spearheading partner in the Global Polio Eradication Initiative, along with the World Health Organization, the U.S. Centers for Disease Control and Prevention, and UNICEF. Rotary club members worldwide have contributed more than $1.2 billion and countless volunteer hours to the polio eradication effort. Great progress has been made, and the incidence of polio infection has plunged from about 350,000 cases in 1988 to 222 reported cases in 2012. More than two billion children have been immunized in 122 countries, preventing five million cases of paralysis and 250,000 pediatric deaths. With many clubs struggling to attract younger members, consider inviting a non-Rotarian friend or co-worker to your next social or service project — rather than to a club meeting. It’s a more casual approach that can be highly effective in introducing others to your club’s activities. 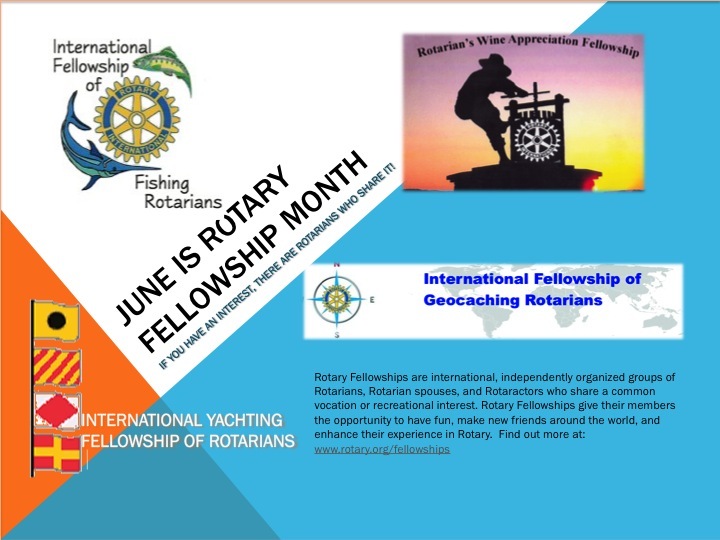 And it’s a way for your non-Rotarian friends to meet club members. An invitation to a club meeting can come later; this year, focus on engagement by inviting community members to experience Rotary in active service. With your help, we have made tremendous progress in the fight to eradicate polio. We are at an historic moment -- less than 1% away from the end of polio forever. In honor of World Polio Day on 24 October 2011, we are asking for your help to tell the world about Rotary's achievements and to finish the job. Make-ups are awarded to all members (including Board members) who attend the monthly Board Meeting. They are scheduled for the second Wednesday of each month at 11:00. Check the Events Calendar for the location. Come join the fun.